This page has instructions and tips for using the members only portal. Use the Members Sign In link to access members only documents and features. Also look for the link under the Connect menu and at the footer of each webpage. Get a password by selecting the option “Request Password”. Enter your email and a system generated password will be sent to your email account. Use this email/password to Sign In. You can change your password once signed in by going to Manage Profile & Renew Membership > About > Password [click on change] > type whatever you prefer to use for a password > be sure to click Save & Continue. You can review and edit the information submitted when you joined BAMA. This is a convenient way to ensure the data for your account is current. The About tab displays all the data as editable fields. Just be sure to click "Save & Continue" at the bottom of the webpage when finished. If you are a current member or a member last year, your membership can be renewed by providing a credit card or check payment. Using the members portal saves you from retyping all of your profile information. Go to BAMA Member section > click on “Renew, Upgrade or Update Billing” > select “Pay by credit card” or “Pay by check”. The credit card processing is secure. Transmissions are SSL encrypted and processing meets the Payment Card Industry Data Security Standard (PCI DSS) compliance standards. The privacy settings are located on the profile tab on the "Manage Profile & Renew Membership" webpage. Here you can choose which, if any, of your contact information is listed in the online members directory. Make your selections and click "Save & Continue" at the bottom of the webpage. Your preferences will be applied immediately. Your profile settings are located on the Profile tab on the "Manage Profile & Renew Membership" webpage. You will see your name and the contact information (set in the Privacy Settings) listed on the Profile Card. You can add a picture by clicking on the box area in the upper right corner of the card. Face pictures are recommended. In the Profile Gallery you can upload multiple pictures of your Miata adventures. The Profile Description is a place to type an introduction about yourself, and you can add links to your social media accounts. As a BAMA member, you can advertise a deal for Miata related items including Miatas for sale. 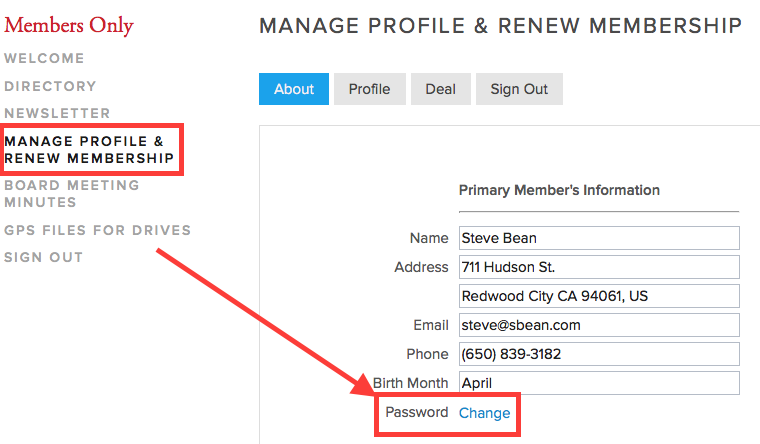 The settings are located on the Deal tab on the "Manage Profile & Renew Membership" webpage. Here you can upload a photo, add a title and provide a description of the item including price. Your contact information will automatically be linked and your ad will appear on the "For Sale" webpage. You can see a list of BAMA members on the Directory webpage, as well as, search by name or even distance from your location. A map pin-points where other members are located. Clicking on a profile card will display more information about the member including a gallery of photos and a profile description if the member has uploaded this information. 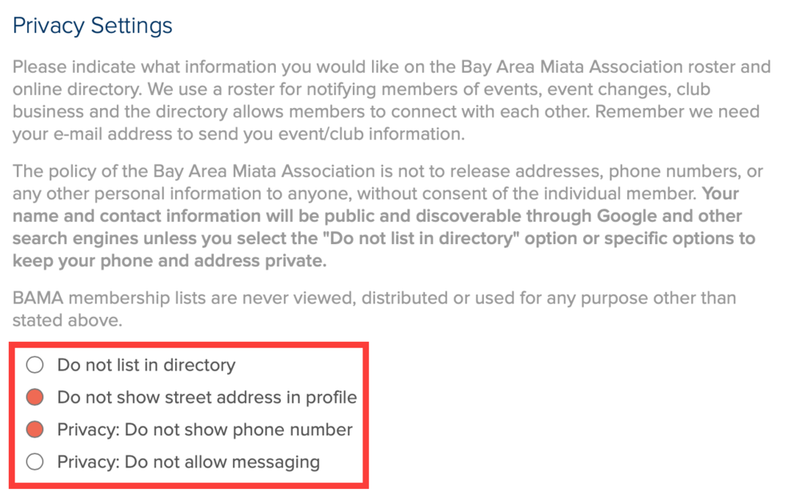 After clicking on a member's profile card from the directory search results, click on the "Contact" tab and "Send a message" to send an email to another member directly online without the need of using your email program. Go to "Events" in the main menu and select either "List View" or "Calendar View". RSVP for an event by clicking on the event of interest to display the details. Scroll to the bottom and click on the "Send RSVP" button. You will see your name and passenger's name that is already in the database. You can change the names or delete the name for a passenger if need. The RSVP quantity selection is set to 1 by default. Please change to 2 if you will have a passenger. This helps with the event planning. If you have previously registered for an event, you will get a popup message reminding you whenever viewing the event details.